An accident is an opportunity which can be grasped or misused. We will continue Praja’s dream further on, but first I like to tell you another story about Shano. As an example I will tell you another story of the past lives of Shano, some ten lifetimes or more than four thousand years ago, long before the life in which he committed suicide. Shano was living in a village of only a few hundred houses in a faraway country, where his father was a carpenter. It was quite a good business, because there was hardly a day when nobody needed anything made of wood. Shano’s father was a good carpenter, though somewhat hot-tempered at times, when he would be unnecessarily disturbed in his concentration. Then he would not say a word to his wife for the rest of the day. No human being is perfect. Besides making furniture he could also help in house construction. His furniture was characterized by wonderful woodcarvings. The carvings were mostly round interlaced figures, but he could also make the most beautiful birds and plant ornaments, or beings that perhaps only existed in human fantasy, or even fishes – though the ocean was so far away from the village that most people knew it only from hearsay. He applied his woodwork for backs of chairs or benches or beds, or for frames of pictures. But this type of work was time consuming and therefore expensive, and you needed the best types of wood for it. Most of his work consisted therefore in the coarser work of providing beams for houses, and making simple tables and stools. Mother was often singing (usually about some deity, or songs everyone knew). She was good in preparing delicious sweets, which she also provided to the other villagers, especially children. Her cooking was also really delightful, and the meals, though very simple as to ingredients, were a moment of joy for the family each day. They had two boys, the younger one, Shano, and one three years older, Marico. When still young they learned the skills of woodwork from their father and both where proud of what they accomplished – though clients coming to the shop always smiled, but rarely bought any of their creations, and if they did, these were always Marico’s. Shano always hid his anger. When they became a little older they became both good toy makers, and before long all the children in the village were playing with their toys: wooden horses or camels or elephants on wheels, toy houses of which the little doors could be opened and closed, and even miniature furniture – many things painted in bright colors, others just as the wood was. Shano was also quite good in making such things, but he could never surpass his brother – after all he was three years younger. Father and mother were also proud of their energetic, skillful and optimistic sons. The only thing that worried mother was that Shano was rather hot-tempered at times, especially towards his elder brother. On the other hand, when Shano was hurt by his brother, he would not easily forgive him – but that was inside himself: he would never show it. Instead he would go outside and do something nasty, like throwing dung at buffaloes, and once by “mistake” – he hit an old lady, which invited the shouting of that ugly, very irritable witchlike old granny, of whom all the children were afraid. The fact was that she was crazy, and possessed some witchcraft also, but knew a lot about herbs and some magic spells to heal small ailments. Marico was calmer and was on a whole more contained in his emotions, like his mother. Then there was a cow – a completely white cow. Some other people had one or a few black buffaloes, but Shano’s family had a tender white cow. Everyone loved her. She was very kind, never angry, and provided delicious milk which the children could drink directly from her udder. The milk was also collected in wooden buckets (made by father), but was never collected before the calf of the cow had been given the chance to take enough for herself. The cow could walk around freely, but she remained near the house most of the time where there were some shadowy trees, and where she would be given fodder brought by father of mother or what the children collected for her, and also buckets of water. She seemed to feel best when she was bound to a pole by a cord. Children she would allow to climb on her back and sit there as if they were driving a horse. It was on a whole a peaceful rural atmosphere. There was, between the edge and the center of the village, a small temple, standing at a sandy square with in the middle a big tree which was at least a hundred years old. Under the tree people had make a bench of stones and clay in a circle around the stem, so that everyone could sit there in the shadow when it was too warm to work, or to chat together in the evenings. Shano liked the temple. Inside there was a stone statue, not very refined, rather like a standing black stone with orange painted eyes and some strips of cloth wrapped around it. 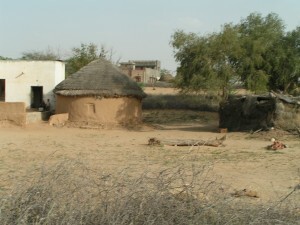 It was the sacred place of the village. The statue represented the protecting deity of the village, and people believed that he lived around the village in the fields, and kept an eye on whatever invisible intruder might come to the village (especially at night) who might cause disease or mishap or misfortune, and he had some powers to chase them away. Some stories of miracles went around, and people believed things that can never be true. Like some old farmer’s wife, then a widow, who lived eighty years ago and received a coin of money everyday from the deity; or a married couple who got a still-born child because they had not cared to do the right ritual at their marriage. But such things as giving coins gods rarely do, if at all, and gods certainly don’t take revenge or let children die before being born to punish their mother or father. That absolutely can not happen with a god. They can not prevent accidents, nor determine what goes on in the people’s minds and what history-threads they spin for themselves. Nobody had ever seen that deity, but some felt his presence, they said. Every inhabitant of the village would regularly go to the temple to bring some offering to the god – some grains of wheat, or fruits, or milk. They were really only offerings to their own fantasies. They never saw anything special happen there, but it always strengthened the people’s devotion – and devotion one could feel in the atmosphere inside the temple. But if you could have seen it, you would have known that there really was something there. The temple was several generations old, but looked very tidy and attractive. Always people kept the place proper, and went there to wish good things – or if they were in a bad mood, they would usually come out in a calm and happy mood. When the temple had been consecrated, some generations ago, just after it had been build, an unknown but wise priest had arrived from elsewhere without having announced his coming. But people felt at ease with him, and he had the knowledge about how to perform rituals. First the priest had meditated in the temple for three days, while fasting, and then had said only a few holy words while his appearance was so quiet that everyone who had some problem in his mind and feelings, became quiet. The priest had left and never returned. But something of his atmosphere seemed still to reside there. In this way evil influences kept away from the village, because they just didn’t feel at home. Shano was a sensitive boy when he was seven or eight, and he felt always some special feeling when he was in that temple – where he preferred to sit alone on the floor.